To instill into the minds of pupils such a love of literature as will last beyond school-days and be an unfailing source of profit and delight. Special attention has been given to the poetical pieces, many of which, if learned by heart, will prove a “joy for ever” to the diligent scholar. To impart useful information. It is hoped that each book will afford a compendium of useful knowledge as well as a treasury of beautiful thoughts. To provide matter of such variety and interest that the valuable art of reading aloud may be fostered. To this end lessons have been chosen from a very wide field. To teach pupils to speak and to write good English. The lessons in the upper grade books should furnish material from which senior pupils may learn to appreciate what is meant by an author’s style. Such appreciation, accompanied by the judicious imitation of good models, should lead to an improvement in the pupils’ own methods of composition. To secure a careful gradation of lessons so that each book may naturally follow its predecessor by a gradual but almost imperceptible increase in difficulty. The books have been suitably illustrated, and coloured plates have been included with a view to making the books attractive to children by quickening interest through the eye. At the end of each book are placed lists of the most difficult words that occur in the lessons contained in that book. Department of Education Queensland. 1967. 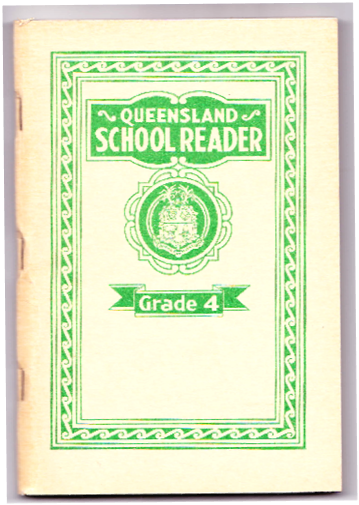 Queensland School Reader: Grade 4. Brisbane: Queensland Government Printer, pp.v, 1.